Bringing new technology and sleek style to the contemporary bath, Levity shower doors feature an innovative bypass system and roller design that provide an amazingly smooth, quiet sliding action for a difference you can feel. Levity's unique design, including fully bypassable glass panels, makes installation easier than ever and allows for adjustability while the door is hanging. Vertical blade handles complement Levity's modern minimalist look, creating an open, inviting space for showering. Frameless design highlights showering area. Innovative roller design simplifies installation and provides out-of-plumb adjustability. Frameless, 1/4 inch (6 mm) thick frosted Crystal Clear glass. Door tracking system features a hidden, cushioned, center guide for smooth, quiet sliding action. Contemporary vertical blade handles complete the look of this door. The Fluence bypass bath door features a Eurostyle frameless design with Falling Lines 1/4 In.-thick tempered glass. Designed to accommodate out-of-plumb installations, this door features a continuous panel guide for smooth, quiet sliding action. This 58-5/16 in. tall bathtub door features a frameless design with a CleanCoat glass coating for easier cleaning and a sleeker design. Also available in store by special order only see store for details. Levity 60-1/4 inch X 74 inch Frameless Sliding Shower Door With Handle In Silver Bringing new technology and sleek style to the contemporary bath, Levity shower doors feature an innovative bypass system and roller design that provide an amazingly smooth, quiet sliding action for a difference you can feel. Levity's unique design, including fully bypassable glass panels, makes installation easier than ever and allows for adjustability while the door is hanging. Vertical blade handles complement Levity's modern minimalist look, creating an open, inviting space for showering. 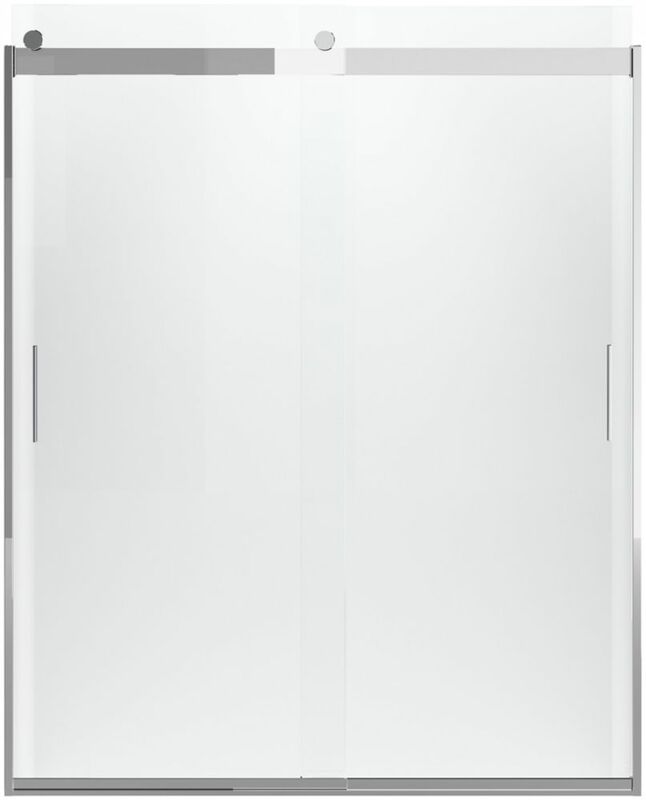 Levity 60-1/4 inch X 74 inch Frameless Sliding Shower Door With Handle In Silver is rated 4.3 out of 5 by 109. Rated 5 out of 5 by Vishal from It looks good and works just as expected. No issues.... It looks good and works just as expected. No issues. Rated 1 out of 5 by Madalena from Installation instructions direct the installer to use ONLY a clear silicone caulk to adhere and s... Installation instructions direct the installer to use ONLY a clear silicone caulk to adhere and seal both the center panel divider and the outer bottom sill channel. Nice thought in theory, however, this method of securing both pieces allows for movement of the center panel divider and, if not caulked perfectly, allows for the tiniest of leaks at the bottom sill channel. Comparable competitor's products do not have these issues. Rated 3 out of 5 by Dennis from The product arrived in a box that was in rough... The product arrived in a box that was in rough shape. Had my doubts the door wasn’t damaged. Well all seemed well and I installed per plans. The horizontal rail which carries the rollers had a terrible finish. Dark marks that would not come off. The owner accepted the product due to time restraints. Rated 5 out of 5 by SC from This unit is beautiful! We have received so many... This unit is beautiful! We have received so many compliments. Rated 5 out of 5 by Turkey from Looks great. Easy to install. Time consuming to drill holes through tile. 12 holes needed. Looks great. Easy to install. Time consuming to drill holes through tile. 12 holes needed.